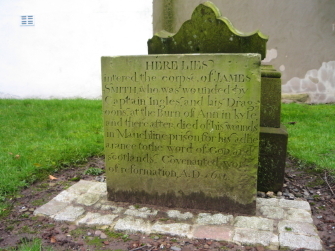 James Smith was captured at Burn Anne, near Galston, and brought to Mauchline Castle where he was held prisoner. He was captured following the Covenanter attack on Newmilns Tower, having been wounded by Captain Inglis. He died of his wounds and was buried at the east end of the kirkyard. The date of his death was probably 1685, though the gravestone reads 1684. The small headstone is located at the east end of the churchyard.